Efficiency is the key to success in shrimp production—creating the conditions for shrimp to efficiently convert nutrients into body weight, and running a business that achieves that conversion efficiently. The NaturalShrimp Company, on the outskirts of San Antonio, Texas, has turned efficiency into an art form, supplying an eager market with weekly harvests of fresh, chilled shrimp. Since its inception in 2001, the company has mastered the art of recreating the ocean environment in a recirculating, biosecure inland environment, ideal for environmentally friendly, high-density production of Pacific white shrimp (Litopenaeus vannamei). NaturalShrimp’s proprietary system maintains water quality in its tanks, says Dr. Doug Ernst. But it’s not easy. With various water treatment technologies used to manage shrimp metabolites such as ammonia and long-term accumulation of nitrate, the other critical challenge is maintaining a healthy growth rate in the tanks. Temperature and oxygen are the fundamental parameters, says Ernst, and have been managed automatically since NaturalShrimp installed its first YSI 5200 multiparameter continuous monitoring systems at start-up. But the true driver of the production system is NaturalShrimp’s automated feeding system, which is managed by YSI’s Feed SmartTM feed timer system, a fully automated program designed for YSI’s aquaculture monitoring products (5200A, 5500D, and 5400). 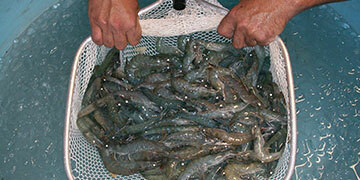 NaturalShrimp starts with PL10 hatchery shrimp and grows them out to harvest size. Based on population, weekly body weight samples and feed conversion ratio for L. vannamei, Ernst programs his YSI monitors—Ernst calls them “panels”— to deliver precisely enough feed each day to meet growth targets. One of the highlights of the YSI Feed Smart feed timer system is the ability to steadily deliver feed over a 24-hour period—a pattern that is critical to dealing with shrimp, Ernst points out. “Shrimp are different from tilapia or salmon in that they have a very short gut,” he explains. “They don’t really have a stomach they can fill up—they’re not event feeders. They’re continuous grazers. Because the YSI system only provides as much feed as will be eaten in the specified feeding interval—programmed into the control panel as the number of feeding events per day—waste is reduced dramatically. For aquaculture systems in general—both biofloc and filtration-based technologies—uneaten feed goes straight to the bottom of the microbial food chain, the bottom of the tank, or the bottom of the waste solids removal…and therefore to the bottom line. “The other big concept in automated feeding is the reduction of labor,” Ernst points out. “In a full facility, if you’re manually feeding all the time, then you’re talking about swing shift and graveyard shift, and somebody coming in on the weekend. Just to get that feed out, you’re talking about 24/7 staffing. It would work out to an extra 4.2 full-time equivalent (FTE). The YSI 5200A system replaces that labor with a simple desktop interface that is easy to program for up to 100 feedings per day, measured in ounces and pounds or grams and kilograms. The system increases feed daily based on user-defined feed conversion ratio (FCR), either in Continuous or Timed modes. The YSI 5200A can also decrease feed levels based on dissolved oxygen (DO), temperature or pH values, defined by the user—in Ernst’s metaphor, applying the brakes to metabolism until the system is stabilized. Ernst uses his YSI monitors to keep constant track of temperature and DO, though the YSI 5200A is also capable of monitoring conductivity (salinity), pH and oxygen reduction potential (ORP). Ernst also manually samples for ammonia. Ernst says NaturalShrimp’s YSI controllers have grown with the company’s business. “As we’ve seen improved growth rates over the years, we can input that into the panels,” he notes. That flexibility has led to a tremendous trust in the automated feeding system.